Support for Cliven Bundy is rooted in agrarianism. | Opinions. We have them. Thinking and writing about first and second lives. Support for Cliven Bundy is rooted in agrarianism. 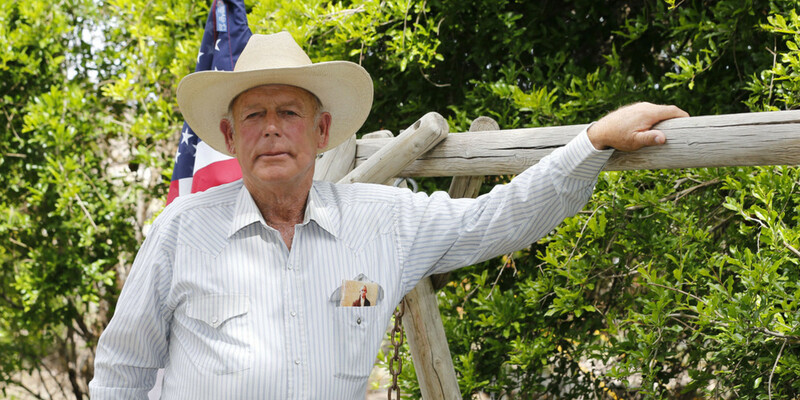 Photo: Huffington Post Cliven Bundy poses in front of the flag of a government he does not recognize. I have not a single whit or whisper of sympathy for Cliven Bundy, the scofflaw and parasitic Nevada rancher whom the extreme right has chosen as their current poster boy for state’s rights. I don’t have a tremendous amount of interest in him or his situation, either, other than he serves so well as an exemplar of how current political conflicts are rooted in symbolism and culture far more than in policy and fact. The specifics of the Bundy controversy are not that important nor that interesting. He disliked a Reagen-era policy shift in land management and decided to quit paying his grazing fees. He did not, however, find other land to graze his cattle, but trespassed on public land for decades, while the Bureau of Land Management sought and won several court judgments against him. However, since he refuses to recognize the validity of the federal government or even the existence of the federal government, he ignored the court orders. The BLM arrived to collect his cattle to sell it in order to pay down his debt. He threatened them with guns and was supported by members of militias from around the region. A standoff ensued and the BLM backed down to pursue other measures. This leaves us at an important decision point – are we a government of laws – or can criminals really resist the law with impunity if they have guns and FOX news? Bundy’s only importance is that he crystallizes a dangerous trend toward governance by gun, the rule of the thug-ocracy. Cliven Bundy is the new poster child for the right, but he was a bad choice. Yes, he does embody their devotion to state’s rights, but from his rhetoric, it’s clear he embodies the states’ rights movement too well. It began as opposition to abolition, continued as the foundation of Jim Crow and has resurged since the sixties in opposition to Civil Rights. States Rights has always been about most passionately about racism and it’s fitting that their new poster child is almost too racist for them to stomach – suggesting as he has that black people would be better off back on the plantation. So why did they rush to support this ignorant racist thug? Certainly many of us know that Sean Hannity would not be lionizing an African-American resisting the illegal foreclosure of his home with armed support from his particular obsession, the New Black Panthers, even though that African-American homeowner may be more on more solid legal ground than Cleven Bundy has stood on in twenty years. But, Hannity et. al. are not supporting Bundy because he is white, they would not support a white homeowner in a similar situation either. They support him thanks to our heritage of Agrarianism. America has always been in thrall to Agrarian Romanticism. You can see that thralldom in our Constitution that puts its thumb on the scale to favor rural states over urban states in the Senate and Electoral college. A voter in Wyoming has 66 times more representation in the US Senate than a California voter. A vote for President cast in Wyoming counts three times as much as a vote in Wisconsin. Thank you, Thomas Jefferson. Yes, Thomas Jefferson and his fellow Agrarian Romantics are responsible for our cultural reverence for those who work the land. 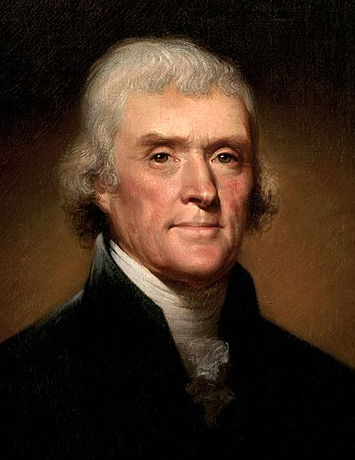 As Jefferson put it in a letter to John Jay, farmers “are the most valuable citizens. They are the most vigorous, the most independent, the most virtuous, and they are tied to their country and wedded to it’s liberty and interests by the most lasting bands.” This bias continues to play out in contemporary America where the farming states are referred to as the heartland and rural Americans can be called “real Americans” by a vice-presidential candidate with no one in her party criticizing her for implying that folks in more urban states are less authentically American. There is a constant subtext in the media that people in rural America are more honest, more patriotic, more moral and more American than the rest of us. So there is an culturally-received halo of righteousness and patriotism that is handed to Cliven Bundy simply because he is a rancher – even though he calling someone who denies the existence of the federal government a patriot is beyond Orwellian in its pathology. What he did and who he is matters so much less than the symbolism of the rancher – the “more valuable citizen” against the state – which is of course, urban. Well, I grew up in the country. I did not have running water. I have fished and hunted, herded cattle and milked cows, picked vegetables and baled hay. I have cleaned out stables and even thrown a cow pie or two. My family includes farmers, ranchers and rodeo queens. Now I live in a city. And you know what, people are people wherever they are. I can cite statistics that counter the argument about rural Americans being “more valuable citizens” by pointing out that they use more drugs, are more violent, divorce more frequently, have more domestic violence, have more teen pregnancies and so on. I do not think that is a factor of being on a farm, but a factor of poverty. People in rural areas are poorer than people in the cities – and poverty has pressures and traumas that those who have never it experienced cannot fathom. If you are rich, you can go to psychiatrist and get a prescription to help you cope with your pain. If you are poor, you can buy some illegal drugs and get a prison sentence. People in rural areas do have knowledge and skills that folks in the city lack. But guess what? The reverse is equally true. Country folk may know how to forage for wild plants, but city folk know how to negotiate public transit. Country folk can catch a fish, city folk can catch a cab. Different lives require different skills and there is no moral superiority in either life choice. Because we have mythologized the cowboy and the farmer as somehow more valuable, we choose worthless heroes such as Cliven Bundy – a thug, a trespasser, a thief, a coward and a racist. There is nothing “more valuable” about him. I think it is long past time for us to end this absurd idealization of the agrarian life – especially by politicians and media blowhards whose image of rural life is as phony as Bundy’s “ancestral lands.” People in cities constantly underestimate the education and sophistication of rural people – not realizing that a farmer has to understand the commodities markets as well as any Wall Street hustler. On the other hand, they constantly overestimate their moral authority and wholesomeness. The stereotypes are self-contradicting – unless ignorance and moral authority go hand in hand. Cliven Bundy is not a good representative of the farmers or ranchers. Most of them pay their grazing fees and obey the law. He is a bum, nothing more. And it is our cultural worship of the agrarian life that blinds people to what a miserable bum he is. Bundy’s a welfare queen, siphoning off the state, abusing subsidies, and stealing from the American taxpayers. He is /exactly/ who Hannity, Cruz, the Kochs, and so on, shriek about. I agree up to a point. However, people on welfare are receiving their small benefits legally. I don’t want to shame people on welfare by associating them with the kind of parasite Bundy is. He is not receiving legal, legislatively approved benefits, but expropriating public lands outside the law. I have no issue with society tending its own- a government that /doesn’t/ take care of its people has no legitimate reason to exist. By “welfare queen,” I specifically mean the oft-referenced bogeyman of the oligarchs and corporate goldfish, used to frighten the undereducated while simultaneously reassuring them of some mythical “other” leeching away the same benefits as them.